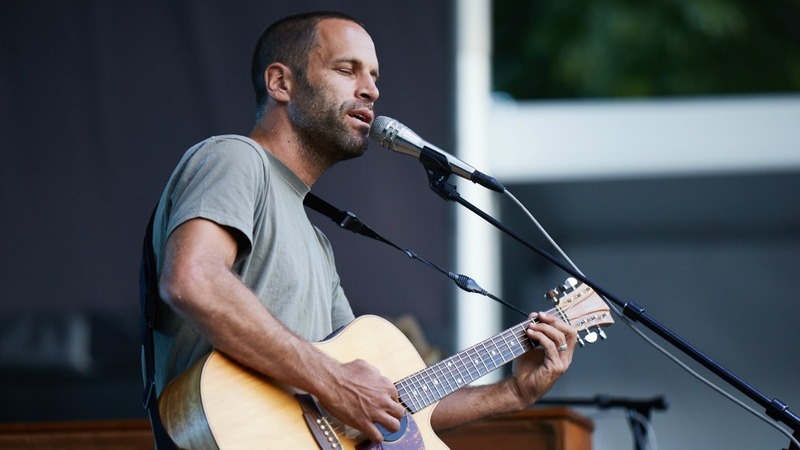 It was a perfect night for a Jack Johnson concert, and Forest Hills Stadium was the perfect setting. On the cusp of summer, Johnson brought his feel-good vibes to a crowd of adoring fans, and a career-spanning setlist brought smiles, blissed-out dancing, and many sing-along moments. There was also the promise of new material, as a yet-to-be-announced seventh album is said to be coming soon. About halfway through the show, we got the first glimpse. As the sun set, Johnson and the band shifted gears into a more acoustic “campfire style” set-up, with Johnson pausing to say that he had a lot of family in the audience, including his mom, “aunties," cousins and kids, as well as the extended family of his bandmates. He then dedicated the song “Constellations” to his family, explaining it as song about his dad taking him camping when he was a kid. This was the natural set-up for unveiling the new song "Big Sur," accompanied by Zach Gill on melodica — an instrument that Johnson said he always brings along on camping trips. It was clear how important family is to Johnson. He introduced "Tape Deck," off his last album, From Here To Now To You, by saying that his mom always encouraged him, no matter how bad his band sounded. Johnson also brought out members of the opening band Bahamas, as well as a newer member of his extended musical family — singer-songwriter John Craigie — who Johnson had met in Hawaii and is taking on the road for a few dates. In addition to dedications, the set also included some unexpected covers. After "The Horizon Has Been Defeated” was sent out to the local chapter of the Surfrider Foundation attending the show, the song segued into a cover of Sublime's “Badfish." Later on, Johnson gave a shout-out to FUV's own Rita Houston before his rendition of Wreckless Eric's “The Whole Wide World." He then closed the main set by bookending two tunes from his Brushfire Fairytales debut ("Bubble Toes” and “Mudfootball”) with verses of “The Joker” by the Steve Miller Band. After a romantic moment dedicated to the anniversaries of Zach Gill and his wife, as well as a couple in the front row, the evening came to a fitting end with the biggest and sweetest sing-along of the night: "Better Together." And in times like these, hearing thousands of voices singing along was just what we needed. Listen to the full show below, and stay tuned to FUV for more "Summer of FUV" shows to come. Full schedule here.